Embrace nature's solution to our emerging water shortage--collect rainwater! When drought sets in and rain is short, rain barrels can provide that precious water you need for your lawn and garden. Our authentic oak barrel texture is molded into each barrel and will not fade, rot or risk insect infestation. A built-in planter adds life to your water collecting. The RTS Accents rain barrel has many unique features including being fully round for a more authentic barrel look, linkable to other rain barrels for increased capacity, screen to keep out debris and insects, and a shut off valve for hose hook up with dual overflow. This rain barrel can provide up to 35 gallons of pure unchlorinated water. During heavy rain falls, a typical roof can produce hundreds of gallons of water and by saving that water, you can reduce your average water usage. With those kinds of savings, this rain barrel can pay for itself in just a few seasons. A front side overflow keeps water from flooding against your outside wall. It is recommended that you drain your barrels when temperatures approach the freezing point. 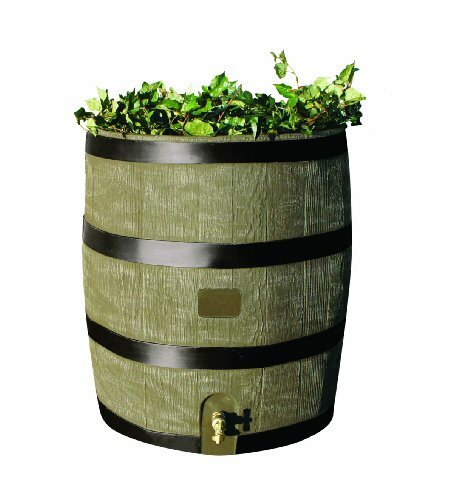 Optional barrel stands create a larger offset between the spigot and the ground, making it easier to fill watering cans and for general use. Woodgrain.